Meet Jeff. I learned about this remarkable little guy from my buddy Lisacat. Here is his story as written by the woman who found him: Shawn, a BARC Cat Loft volunteer. Jeff Bridges is the kitten I found while I was running over the Queensboro Bridge Thursday morning. How the hell he got on the pedestrian walkway of the bridgeâ€“a long, long fall on the right, eight lanes of traffic on the left and non-stop on-ramps at either end is anyoneâ€™s guess. But there he was, scampering toward Manhattan with no intention of letting himself be caught. Pretty much all the other options besides somebody grabbing him were certain death, so I went after him. After a short pursuit in which I was afraid I would chase him either over the side or into traffic, I caught him trying to hide under a railing. I had to reach in at an angle and my grip was awkward. I think only my shelter experience kept me from letting go when he panicked and started biting my hand like his life depended on it. It really hurt and it bled a lot. But I just hung on until I could get a good grip scruffing him, then maintained that very hard scruff (ouch, it must have hurt him) with one hand while I rifled through some construction workersâ€™ stuff with the other hand to find the paint can I ended up putting him in. I grabbed a scrap of plywood to put over it. The construction workers, who were fairly far away, saw only some frenzied woman ransacking their stuff, and came lumbering over to challenge me. I had to explain it all to them and keep them from lifting up the board to look in. Then I walked the little guy off the bridge, hailed a cab with my foot and prayed the fumes in that paint can werenâ€™t going to kill him. The can, it turned out, was old enough that fumes werenâ€™t an issue. But itâ€™s not like I had time to think about that up there on the bridge with probably less than a minute or two before he would have somehow managed to squirm away from me. You can see the print on the paint can, which actually says Queensboro Bridge, in some of the photos. You can also see the band-aids on my fingers, which are fine now. At first I assumed he might be feral, but it turns out heâ€™s a total purring sweetheart who obviously has had a great deal of handling and affection. Heâ€™s about 7 weeks old, appears to be in good health, and is negative for feline AIDS and leukemia. 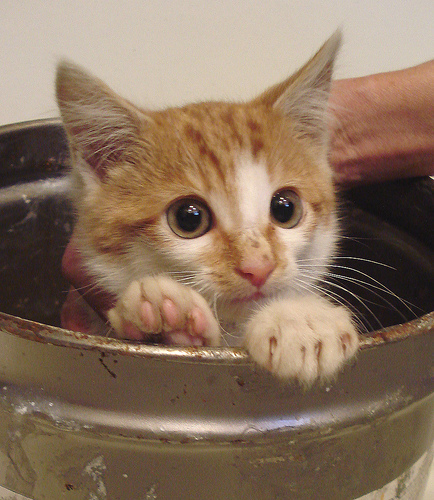 He is weaned and uses the litterbox. I have treated him for fleas and worms and will be giving a distemper shot and having him neutered shortly. Anyone who is interested in adopting him should contact me directly, not the shelter. There will be an adoption fee of $50 to $100 depending on how long he stays with me and how much the vet work costs. I will require an adoption contract and I will do a home visit and reference check. I strongly prefer to place him in a home with at least one other cat or kitten, but will consider letting him go solo if there are gushing references from people I know. Those of you who are interested in giving this Evel Knieval of kittycatdom a home can contact his foster mother by clicking here. Be sure to check out the re-enactment of his jaunt on the 59th Street Bridge on Lisacat’s Flickr page too. It is very cute. 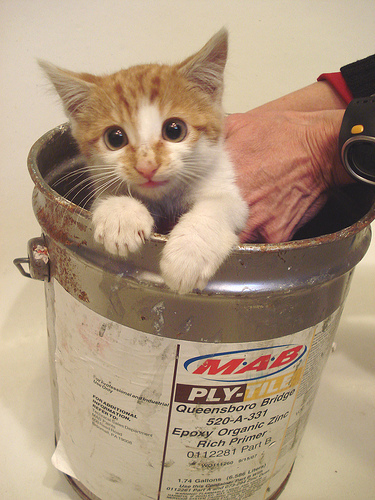 As is this photo of Jeff posing in the paint can that whisked him away to his new “home”. 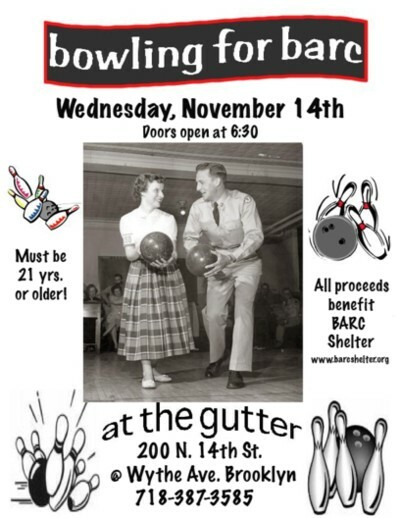 To close on a related note, BARC will be hosting its “Bowling for BARC” fund raiser tomorrow night at The Gutter. Why not bowl a few rounds, have fun and help some animals in need? Bowling is one of my favorite sports: it can be played without putting down one’s beer. brave boy – and lucky – cats really do have nine lives! i really hope this one finds a good home. total orange sweetheart.